Goose as it was dressed when it was stolen from a yard around October 1 to October 3, 2011 (See more goose pics on The Cardinal’s Facebook crime album). UPDATE: The goose was reported recovered on October 10, 2011 when a resident in a south side Arlington Heights neighborhood woke up to see the concrete goose staring at him on the front porch one morning. He kept the goose a few days until he found out from a Chicago Trib Local Arlington Heights article that the goose had been stolen. Arlington Heights police received a report that an unknown offender or offenders removed a gray concrete landscaping statue of a goose (unknown value) from the front porch. 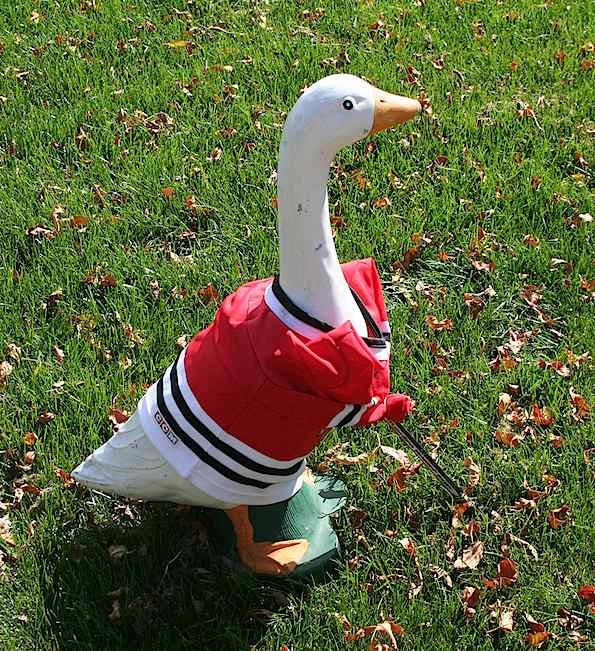 The goose was wearing a Blackhawk’s hockey jersey and was holding a hockey stick in the 700 Block a S. Walnut Avenue. The crime is reported to have occurred between Saturday, October 1, 2011 at 10:00pm and Monday October 3, 2011 at 8:00am.